I apologize, but I did have to take some files off this site because of possible Copyrighted material within them. Bummer! But fortunately, Obe Hostetter gave me a bunch more to post. 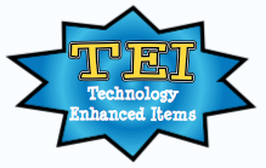 RCPS is now coordinating with www.allenteachers.com to help develop more web based TEI questions. Check out what they've already created. There are also some reading tests I created on my Assessments page. They are not interactive TEI questions, but do have the look and feel of the VA SOL Reading Test.